I'm laughing because of how long it took to get a decent shot of us both! There was cake and sandwiches, awesome conversation, a sneaky peek at an excerpt of Frail Mortal Heart, a cover reveal, books being signed and probably (for me) most excitedly, I was able to interview Zoë for the Bookish Brits. It was wonderful. It was my first time interviewing someone in person, but I'm quite happy with the ways things turned out. I didn't, in fact, edit a single bit of the footage so that's another first! Here's that interview, do let me know what you think, it was a pretty nerve-wracking experience for me. I do love Zoë Marriott's books so much. On our name labels at the blogger tea, it did ask what our favourite of her books is. It was a tough decision, because while I ADORE the Name of the Blade series and know that the trilogy will become a favourite once Frail Mortal Heart is published, my favourite (for now) is still Shadows on the Moon. During the tea, Zoë was absolutely great at answering loads of questions about her research into Japanese mythology and some exciting ideas for future projects amongst other things. There was also quite a lot of discussion about diversity. It made me really happy that diversity and how important it is to be included in books was at the forefront of so many conversations. At the same time, Annalie (her editor) and her cover designer were on hand to provide some great insights into how both of their roles shaped the finished books. I thought it was all completely fascinating and I loved that I was able to share in this whole thing with everyone. Including some of my favourite bloggers! What a fantastic day it was. I went home with a sackful of signed, dedicated books, the first chapter of Frail Mortal Heart and a big smile on my face. Thank you again to Zoë Marriott, Annalie Grainger and everyone at Walker Books for being super stars. 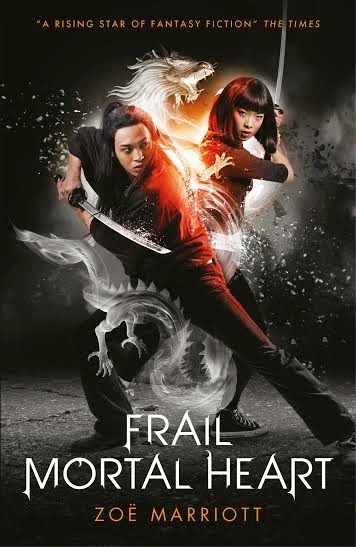 Here, for you all, is the cover for Frail Mortal Heart which will be published July 2015!